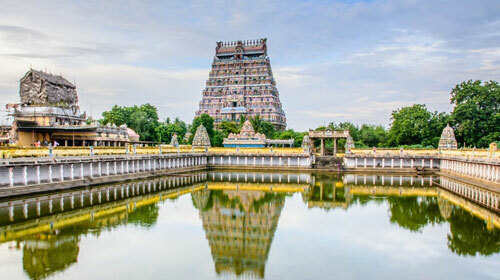 Said by some to be the holiest South India, this is certainly one of the most visited and is famed for a particularly beautiful jewelled image of Lord Nataraja. Nataraja, and incarnation of Shiva, is known as the Lord of the Cosmic Dance, and usually depicted within a circle of flaming lamps. Chidambaram is a significant pilgrimage centre, located near the coast 240km south of Chennai. It is an important industrial city as well, and was a centre of power during the Chola period of South Indian history in the early part of the last millennium. The temple is distinctive not only for its devotion solely to the Bharatanatyam, but because of being among the rate temples where Lord Shiva is depicted by a statue rather than the traditional lingam. The temple complex is a large one, spread over an area of nearly 15 hectares with tall gopurams (temple towers) on all sides. Both the eastern and northern gopurams are more than 40 metres tall. The eastern one is particularly impressive with 108 (a significant figure in Vedic numerology) carvings of various dance poses covering it.